Has been crap since the injury. My favorite player by far but that was absolutely terrible. He was shite alongside the rest of the midfielders. He was starting to play brilliant football, about 10 outstanding games in a row. He needs to start playing football again higher up the pitch. Otherwise drop him/Matic and bring in Fred. Very bad today. Was a headless chicken. Poor today but all three MFs looked like they were drunk. We completely lost it in MF today. Attackers then were not clinical enough when we had the ball. Weak today. I want him at United but not first choice. His engine doesn't seem to have restarted since his injury lay-off, awful on and off the ball today. He's been poor these last two games since coming back from injury. Hopefully he kicks back into form soon. His head is in Paris ? I never tought that he was a good player but since the rumors, he's awful. Good squad player but he needs to be upgraded. He is a good player and I like him, but the fact that a player of his quality is holding us to ransom just highlights the squad mismanagement we have witnessed over the last 6 years. Nowhere quality enough to be indispensable, but still is because all the others are worse. e.g. Our 50m buy cannot get ahead of a 23 year old "youth" player who isn't very good. Has been missing in action since the injury. Had to cover the entire pitch today, an impossible task. Really bad today , I hope this transfer talk isn't affecting him. Keeping hold of the ball hasn't been one of Herrera's strongest aspects in his game in recent times. Hella overrated here. A good squad player to have around for certain jobs but by no means irreplaceable. Perhaps shouldn't have been restored straight after an injury. It's not like we was desperate for Him and Matic again. That's two really bad performances from him now, worrying really, he's a very important player for us. Like Pogba, I hope his drop in form isn't down to his future. He is Spanish but he is as far from a Spanish style player you can get. If he receives the ball in a slightly pressured situation he will almost certainly pass it straight back to whoever passed it to him. He is lightweight and he isn't great in terms of output. His best asset is his running. He is coming upto 30 and looks knackered. Not a major loss if he leaves. Rabiot on a free would be a better player. Imagine you'd have a young Edgar Davids in his place. Only thing I'm saying, a club like Manchester United should have a much better player there. There are a lot of players between a young Davids and Herrera. People should not be surprised by his inconsistent performances, there is a reason why he's been in and out of the team since he's been at United over the last 5 years. Precisely, he's representive of the Woodward era average singing with no long term strategy, Ander offers absolutely nothing in the ball even when in good form he's quality is not needed to challenge for the league. Worrying performance in the context of the upcoming game against Barcelona and the remainder of the season. Two poor games in a row now. Overall has performed well under Solskjaer but will be very fortunate if he starts the next game or indeed the Barca match; still expect him to. I like Herrera and would be willing to give him an extra year, possibly two, on reasonable wages (£6m ish) but I don't like the chances of him being an athletic player aged 32. While we were winning match after match with Herrera in the team, he seemed like a vital player for us but after the PSG games, one in which he played and one he missed, and other recent matches both with and without him, I suspect we might be able to cope if he opted to leave at the end of the season. 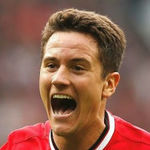 Ander has had the benefit of a lengthy run of games in the team, unlike the current back-up options. He is also approaching an age when decline is to be expected, whereas the alternatives may improve. He's been injured and there's uncertainty surrounding his future. That obviously affects him. Uncertainy regarding his future should not affect a professional. Today we were shown a player like Dacoure could replace him and we would not miss him in our starting 11. To be clear I would really like to keep Herrera at United, I just think he should not necessarily be starting every game. Doucoure who won 0 tackles and 1 interception could replace the guy who made 5 tackles and 1 interception on a bad day? Pogba had more of a defensive contribution than Doucoure had. 2 and 2 for him. He's replaceable. He talks a good game but I think we need better if we are going to compete. I'd still love to have him as a squad player. 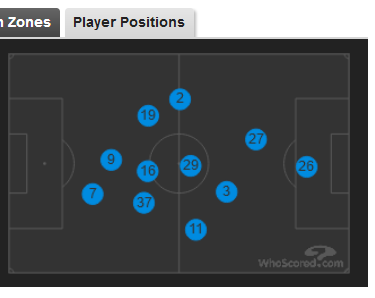 Herrera was dribbled past 6 times, wow, 4 more than United players combined.